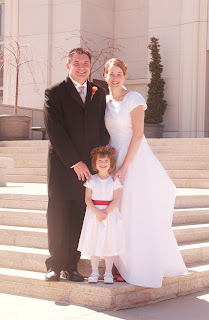 5 years ago John, Emily and I became a family and we haven't been happier. Our Anniversary was actually March 20th and I know I am a little late posting, but at least I did it. I really couldn't ask for a better partner in crime or a better father to our kids. Happy Anniversary babe and hears to MANY more! Congratulations guys. You all look so cute in the picture. I love it! I remember that day! Emily is so little and sweet- the little Emily I met. Oh the memories :) Look at cute little Emily!!! Congratulations and a Happy Late Anniversary! Oh you two little love birds. . . The things I could spill about the two of you right here right now for all to read. . . but I wont- because I couldn't run away from you if you came after me cuz you're too d... fast! Darling pic of you guys. You guys are awsome and one of the sweetest cutest families! I'm so glad to know you. Happy Anniversary! We are so proud of both of you! And Jill, you and Emily, and now the rest of the children, were and are so very welcome into our family! We adore you all.